NBC announced today that The Blacklist has been picked up for a seventh season. Word is that Season 7 was already secured last May when the crime drama was renewed for Season 6, though nothing was said at the time. Currently sitting at an impressive 121 total episodes, the show could surpass the 150 mark if next season follows suit with another full 22 episodes. The network will likely keep it in the mid-season for 2019-2020. NBC has reportedly ordered another 22 episodes for Season 6 of The Blacklist, which is in-line with each of its previous seasons. NBC announced today that The Blacklist has been renewed for a fifth season. The long-running drama has been on the air since 2013, when it broke out as one of the network's top series of the year. Ratings have tapered off since then however, beginning when it was moved to a new night during Season 2. The series stars James Spader as a mysterious ex-government agent turned FBI's most wanted fugitive, who mysteriously surrenders himself to the agency with an offer to them bring down some of the country's top criminals. The only condition is that he gets to work alongside a new FBI profiler named Elizabeth Keen, which leads to a twisting series of events that slowly reveal his true motives. 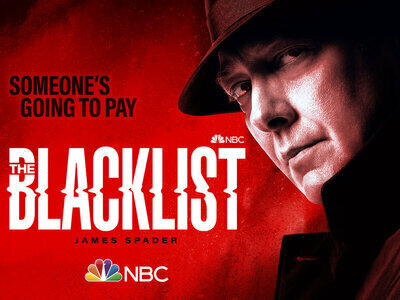 NBC attempted to spin-off a key character from the series earlier this year with The Blacklist: Redemption, however audiences did not take to the new entry and it likely will not return for a second season. NBC has issued an early renewal for The Blacklist, picking up the veteran drama for a fourth season in 2016-2017. The news comes via show creator Jon Bokenkamp, who made the reveal during a podcast interviewon Monday. The James Spader-led series continues to rank as one of the network's top shows, though ratings have dipped since it moved from Mondays to Thursdays where it faces tougher competition. The show is currently on its winter break, with new episodes scheduled to resume on January 7. Look for Season 4 of The Blacklist to premiere in fall 2016. NBC announced today that The Blacklist has been renewed for a third season. The sophomore drama, which resumed the back half of its second season on Sunday after the Super Bowl, will move to Thursday nights for the rest of the season beginning tonight. The James Spader-led series remains one of the network's top shows, consistently drawing high ratings in key demographics. Look for Season 3 of The Blacklist to return for the 2015-2016 season this fall. Mozhan Marnò (House of Cards) has joined the The Blacklist in a series regular role as an antagonist for James Spader’s character, Raymond Reddington. The actress will play Tamar Katzman, a former Mossad agent and incredibly intuitive spy who goes head-to-head with the crafty puppetmaster. The Blacklist Season Two premieres Monday, September 22nd at 10/9c. Mary-Louise Parker has joined the NBC’s sophomore drama The Blacklist in a recurring role. As announced at the San Diego Comic-Con, Parker will debut in the September 22nd season opener as Naomi Hyland, a woman keeping a secret from her husband and who is completely tied to Reddington. NBC is first out of the gate this year in detailing its premiere plan for the 2014-15 TV season. Returning for its second season, The Blacklist will premiere on Monday September 22nd at 10pm. After its winter hiatus the show will then move to Thursday nights in February. Amir Arison, who plays Aram, the intelligent FBI technician and computer genius with a fantastic sense of humor, has just been promoted to a series regular on The Blacklist. Aram recurred throughout Season One, appearing in 18 of the 22 episodes. The Blacklist returns to NBC this fall on Mondays at 10/9c. NBC has released details of their Fall schedule and things are looking fairly static for The Blacklist, for the early months of the Fall season at least. The show is keeping its Monday night 10pm/post-Voice time-slot through to November, when new CIA drama State of Affairs will assume the slot. The Blacklist will then move to Thursday nights in February. Law & Order alum Linus Roache is heading to the hit NBC drama, The Blacklist, as quite the villain. In a few weeks, Roache will show up on the series as the Kingmaker, who is said to be an extremely dangerous and influential man with political ties around the world and he’s also said to be someone who manipulates democracy to his own ends and is an expert at political assassination. The Blacklist airs Mondays at 10/9c on NBC, and its first season will come to a close on Monday, May 12th. The Wire’s Isiah Whitlock Jr. will pop up on the March 31st episode of The Blacklist, as a terminally ill patient who begins working with someone on The Blacklist. Little else is known about the character at this time. Peter Scanavino has been tapped to play the older brother of Tom Keen (Ryan Eggold), who's married to FBI Agent Elizabeth Keen (Megan Boone), on The Blacklist. Tom's so-called brother will come to visit in an episode that will shed light into the brothers and their past, and the truth about Tom's identity. The introduction of Tom's brother follows the reveal that Tom is some sort of operative assigned to watch over Liz, even if that means romancing and marrying her. Scanavino will appear in an episode slated for Monday, March 31st.